This volume aims to reveal how Dewey’s notion of the religious—understood as faith in the human relational condition—offers a way to think differently about the aims and purposes of education. 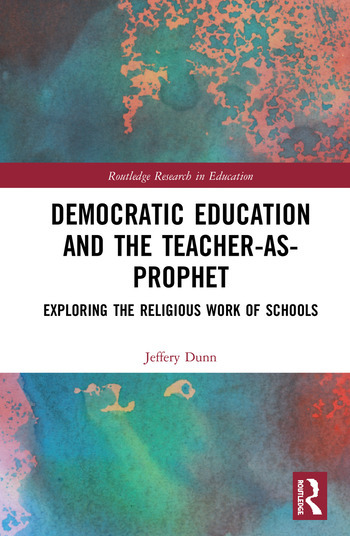 After exploring the effects of neoliberal conceptions of schooling against broader democratic forms of education, this book suggests that Dewey’s vision of the "teacher-as-prophet" is a useful model for positioning teachers as agents of social change. By catalysing the religious work of schools—understood not as teaching religion, but as a process of social unification—the Deweyan teacher-as-prophet can stimulate experimentation towards a democratic ideal of schooling. Jeffery W. Dunn received a PhD (2017) in Leadership and Policy: Philosophy of Education from the Ohio State University, USA.